Offering the ultimate country club lifestyle, Eagle Creek includes more than 400 acres of open space, lakes, wetlands, and trails and is designated an Audubon International Silver Signature Community. The community features an 18-hole championship golf course and a 14,000 square-foot clubhouse with a pro shop, lounge and restaurant. Eagle Creek’s growing list of amenities also includes a sparkling swimming pool, tennis courts, tot lot, parks, and, coming soon, a 9,000 square-foot state-of-the-art fitness center, an additional resort-style pool and much more. Welcoming and inviting foyer with beautiful cased openings and an art niche creates an impressive entry. A well-designed kitchen comes fully equipped with an oversized walk-in pantry and center island which overlooks the sun-filled breakfast area and great room with access to the covered lanai. The master bedroom is fitted with a generous amount of windows, allowing for natural light. The master bath offers dual sinks, dressing area, large shower with bench seating and a relaxing roman tub. Bavaro’s inviting covered entry leads to the foyer, with direct views to the great room, dining room and covered lanai beyond. Ideal for entertaining family and friends, the gourmet kitchen is open to the great room and features an island, ample wraparound counter and cabinet space and a pantry cabinet. The second floor features secondary bedrooms with ample closet space, two bedrooms with a shared hall bath and a third bedroom suite with private full bath. The open floor plan of the Stonehill features a large open foyer leading to a columned dining room with views of the open kitchen, breakfast area and rear yard. The spacious great room is adjacent to the well appointed kitchen, featuring a breakfast bar and separate breakfast area. The second floor highlights include the master suite, accompanied by the master bath which includes a dual sink vanity, dressing area, large corner soaker tub, shower stall, private water closet and oversized walk-in closet. Other features of the second floor include the secondary bedrooms, generous loft and convenient laundry room. Massiano offers the perfect space for entertaining with a living area that includes a formal dining area, a gourmet kitchen with a breakfast bar, a sunlit breakfast area and an expansive great room with a coffered ceiling and access to the covered lanai. Homeowners can also retreat to their master bedroom, which features a coffered ceiling, dual walk-in closets and private bathroom. The welcoming foyer of the stylish Sanibel leads to a private study and a conveniently located powder room. This well-lit home features sliding-glass doors in the kitchen and the great room. The large open loft is adjacent to the luxurious master bedroom and the spacious secondary bedrooms. Additional highlights include a covered entry, a gourmet kitchen with a walk-in pantry and a large center island, a dining area with a coffered ceiling, secondary bedrooms with private baths and a roomy covered lanai. Doral in Eagle Creek features two living areas, two bedrooms and two and a half bathrooms. If you enjoy entertaining, the Doral has an optional outdoor patio with screen. Augusta in Eagle Creek features two living areas, three bedrooms and two and a half bathrooms. If you enjoy entertaining, Augusta has an optional outdoor patio with screen. 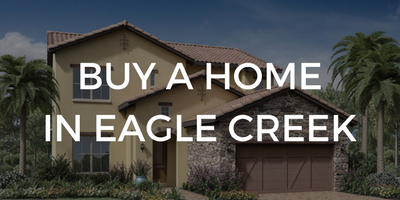 Your future home at Eagle Creek, Pebble Beach, features two living areas, four bedrooms and three and a half bathrooms. If you enjoy entertaining and hosting your family, Pebble Beach offers a covered outdoor patio, with optional summer kitchen. Muirfield in Eagle Creek features a master walk in closet, covered front porch and covered outdoor patio with an optional summer kitchen, in addition to the bedrooms. Residents will also appreciate the open layout living room and kitchen.